The boys over at Phonescoop received a nice little package from Magenta this morning. 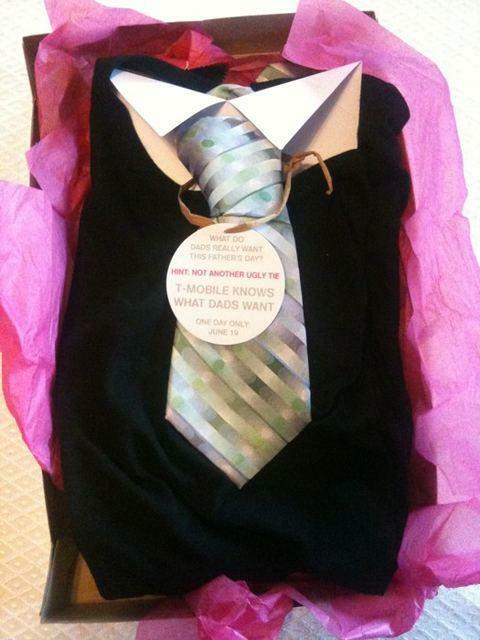 The package contained a tie and the following message: “What do Dads really want this Father’s Day? Hint: Not another ugly tie. 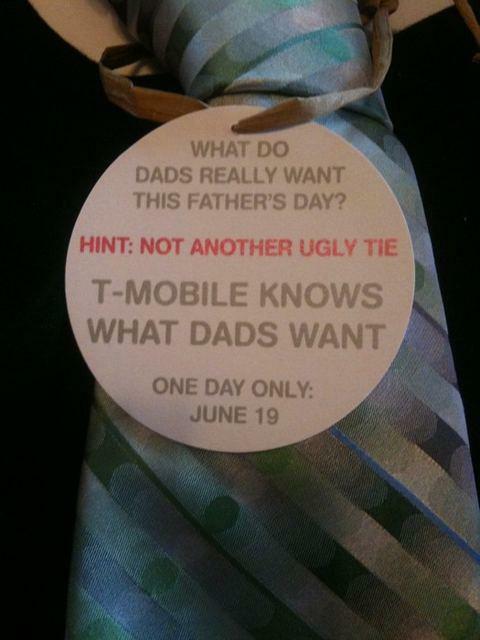 T-Mobile knows what Dads want. One day only: June 19.” If we didn’t know better, we’d think this is the Fathers Day Sale which we leaked the script for just last week…you know, the one where ALL PHONES ARE FREE? ← T-Mobile.com Selling HTC HD2 For $99.99, Today Only! hmmmm wonder what phones are going to be on sale???? i have an evo and im considering 2 options : switching back to tmo (where i ported from) for the samsung galaxy s and just that, or go to at t for the new iphone. im leaning towards coming back to tmo because of the galaxy s, but i really need some sort of confirmation for this so that i can return my evo in time!! gimme some kind of confirmation! lol. oh and im returning the evo because im experiencing the ‘light leakage’ issues at the bottom of the screen. but trust me when i say this, this phone is the best on the market. easily. nothing’s even close. take it from a guy whose been with tmo for 10 years and seen every high end phone they’ve had to offer. i just wish sprint and htc could’ve fixed this issue up or something, but honestly the evo is just a beast hands down. but then again, the galaxy s! please gimme some kind of confirmation!! how does the battery do tho???? Saying you’ve seen “every high end phone T-Mobile had to offer” isn’t saying a whole lot. I’ve been with them for 10 years too and their phone lineup has always been the worst of the major carriers. yeah i know i was just trying to say that ive seen what tmo has had to offer and because its been so bad as compared to the other carriers, i switched…. Funny how tmobile should be advertising this on television during the playoffs….how could you not there a million people watching the celtics and lakers go at it….They cant suspect everybody to figure out these leaks from the computer otherwise these sales are going to be a complete please let the my touch slide be on sale for free tmo..now that will attract millions more to your consumer data base…let’s hope we get what we want and that tmobile doesn’t completely fail on us this time around especially during this summer…let’s do it big tmo, let’s do it big. What do Dads really want this Father’s Day? Nexus One available @ TMobile stores on 6/19 for FREE!!!! N1 in stores – you aint lyin. I just hope it’s easy to root & either get Vanilla A2.2 or Sense UI A2.2 once it’s available on the Galaxy S… Cause the Samsung UI is blah… And no one should ever expect any official updates from Samsung..
They’ll make you waste you upgrade and make you sign new contracts just so they can clean out their inventory of half decent phones. They’re preparing for the Nexus One and the Samsung Galaxy S and hopefully the HTC Sidekick Twist. Just wait it out!! I heard from a corporate store employee that as of now they still don’t know if upgrades are eligible for the free phone. iPhone 4 Is ATT… Not TMobile. It Launched A Couple Of Weeks Ago For ATT. We Know More Than What Reps Think They Know..
Jesus G, how would you know more than a worker for the company itself? Did i say the company ? umm… i Dont Think So.. I Said The Reps. FYI Reps Means Representatives As In Customer Service. do we have to wear that ? SMH. Tmobile is consistently disappointing. Yippty fringin do! Free phones…really! How about new phones!? Im soo done with tmobile. I find myself constantly waiting for them to do something spectacular, something brag worthy. But find myself let down almost ever time. Smh. Snapdragon droids everywhere but tmobile …wtf is wrong with them. Get the n1 on shelves or bring the htc desire, something. it dont even seem like ur trying!! I hate u tmobile!! Breaking up is hard to do, but im leaving u.